This page describes Fanon-level fan-created material. It does not conflict with Erfworld Canon, but it is not official. This material was created by Cubbins. 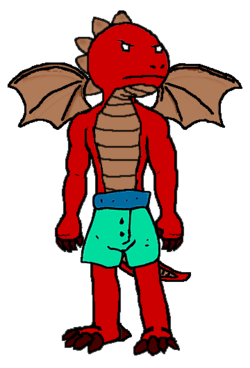 Dwagonmen are a cross between a Dwagon and a Man (as the name implies). They are knight-class commander Units; most of them also possess the Leadership ability (the only ones who don't are Casters). This is unusual, due to the nature of New Mojito's climate sapping combat bonuses; the Dwagonmen consider it vestigial. They are considered humanoids, are sentient/intelligent, produce Casters and Warlords, and start/belong to capital Sides. All Dwagonmen belong to the Libra Tribe; they have only been known to pop in their home Side of New Mojito. A Dwagonman has a very keen sense of smell compared to a normal Erfworlder, and the ability to see through natural Foolamancy such as smoke, cloud cover, or (more importantly) sandstorms. They have sharp claws and talons on their hands and feet, though this prevents them from wearing most types of shoes. Though the wings on their backs seem too small to support them, they are perfectly capable of flight, and this is their preferred method of movement. Much like Dwagons, Dwagonmen are exceptionally lightweight, despite their seemingly bulky appearance. The breath weapon a Dwagonman can use, as well as the types of food he or she prefers (see below), are both strongly influenced by the color of scales they're popped with. A red Dwagonman will prefer spicy foods, and breath fire, for example, while a pink one will tend to have a bit of a sweet tooth and blow bubblegum bullets. Dwagonmen can increase their base stats a small degree and/or receive various other minor benefits (based on their scale color) for a turn by consuming food above the amount provided by the rations normally popped with their upkeep. This effect is limited but notable, and is one of the reasons the side of New Mojito experiments so much with cuisine. (Example: they know what 'cheesesticks' and 'marinara sauce' are, and that it is a preferred snack of yellow Dwagonmen). It is unknown how Dwagonmen would react to Stanley or someone who is attuned to the Arkenhammer. They like getting up-close and personal with enemies, and are also not known to pop with Archery specials. Dwagonmen heavily favor lances as melee weapons when not using their claws. This page was last edited on 26 December 2014, at 06:47.